SEOUL, Nov. 9 (Yonhap) -- North Korea's official newspaper on Friday urged its people to overcome outside pressure and sanctions with unity and self-reliance. The Rodong Sinmun, the organ of the ruling Workers' Party of Korea, said in a front-page editorial that the North's national competitiveness is stronger than foreign pressure and sanctions. In the editorial, titled "Let's go our own way and build a powerful socialist state," the paper said that the world now marvels at North Korea's unlimited national power and development potential, as it is "miraculously" surmounting historically unprecedented brutal sanctions and blockage. "All party members and workers must march for self-reliance with conviction that our national economic power is far stronger than the enemy forces' sanctions and the final victory is ours," the editorial said. "We must walk to the end along the path we choose without being shaken by any adversity. We cannot expect any achievement if we look at others and rely on chances." 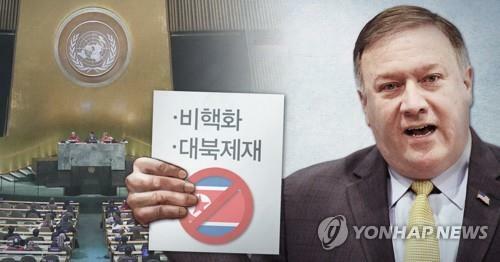 The newspaper's renewed call for self-reliance followed the recent postponement of high-level negotiations between the North and the United States, scheduled for Thursday in New York, to discuss denuclearization and sanctions. In a separate editorial, the Rodong Sinmun stressed that there remains nothing but self-reliance in order for the North Korean people to retain their dignity and honor. Watchers speculate that amid the lack of progress in negotiations with the U.S., the Pyongyang regime appears to be trying to lower the people's expectations for sanctions relief and secure internal centripetal force to survive the sanctions.